King suite includes acacia panel bed, 6-drawer dresser and matching mirror with high-low plank detailing in a distressed natural finish. Make a statement with the Soho king suite, a bedroom that’s as versatile in style as your own wardrobe. Simple silhouettes crafted with acacia veneers create a look that’s always on trend. High-low plank detailing in a hand-distressed, natural finish lends unique, rustic character to the king panel bed, the same detail carried over to the dresser with matching mirror. Each of the dresser’s six dovetail drawers operates on smooth, full-extension glides for maximum storage space, topped with a metal pipe handle for a touch of industrial flair. Queen suite includes acacia panel bed, 6-drawer dresser and matching mirror with high-low plank detailing in a distressed natural finish. Simple queen bed crafted with acacia veneers features panels with high-low plank detailing in a hand-distressed, natural finish. 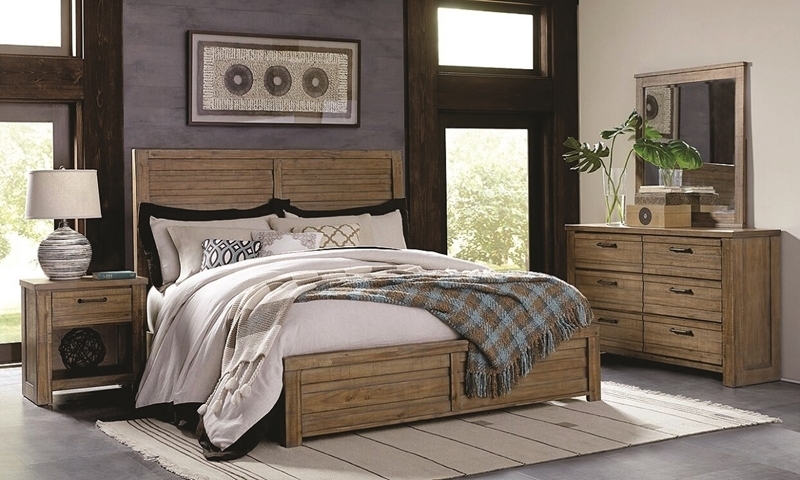 Simple king bed crafted with acacia veneers features panels with high-low plank detailing in a hand-distressed, natural finish.